Colorado is a beautiful state to go RV camping. You’re sure to find some peace and quiet and the campsites seem to be less crowded. In Colorado, we have enchanting mountain views, breathtaking overlooks, beautiful sunrises, and gorgeous sunsets! Be sure to bring your s’mores ingredients, because you’ll want to be sure you are out enjoying the beautiful, cool evening air without all the light and noise pollution that you get from being so close to the big cities. If you are up for an adventure this summer be sure to check out all of these campsites that I’m going to share with you! Where are the Best RV Campgrounds in Colorado? Here are our top picks in no particular order. In this article, we highlight what each of these Colorado RV campgrounds has to offer including amenities, activities, camper reviews, campground info and more. This “pet-friendly” site allows 1 large or 2 small/med non-aggressive dog(s) for an additional fee. Looking for a fabulous RV camping experience? They offer their guests the opportunity to camp right along the river where you can fish right from your site or just sit back and watch the world float by. Nothing beats relaxing around the campfire after a full day of adventure. Each riverfront RV site has water and electric service, private campfire pit, and picnic table. They welcome small RVs, pop-ups campers, truck campers and camping vans up to 32′ in length. Dump station available. Limited to one slide out only. What Do Other RVers Have to Say About Glenwood Canyon Resort? The Dolores River Campground is a beautiful, tree-filled campground that provides a true Colorado get-away. They are located in Dolores, Colorado on the San Juan Skyway with the scenic Dolores River running through the campground. In addition to great fly-fishing on the river, they also have an on-site fishing pond. There is so much to love about the Dolores River Campground. 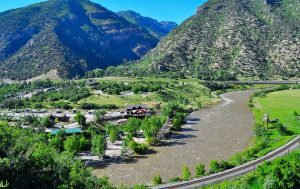 The campsite is located just outside of Durango and Silverton, CO. The campsites very were well spaced and shady, and lots of nature and clean fresh mountain air. Great place for fly fishing in the river, or you can check out the beautiful pond and fish for rainbow or brown trout. What Do Other RVers Have to Say About Dolores River Campground? “We just stayed here for almost a month and were more than pleased with everything about the facilities. The campsites were well spaced and shady. There were lovely walking areas near the ponds and the Dolores River. The restrooms/showers were nicer than any place we have stayed–in fact, they were the subject of discussion by almost everyone we met coming in and out of them–LOL. They have a nice laundry room on site with 6 washers and 6 dryers which was very convenient. We were gone on a side trip for about a week and the hosts kept an eye on our camper which we appreciated very much. When can we go back????? Located just outside Estes Park, Elk Creek Campground is a beautiful and breathtaking chance to get away from it all. Your RV will not be parked on top of your neighbor either. Each spot has grass and trees that will help keep you separated. If you love wildlife, you are sure to see some here! Check-in time starts at 12 pm! You will be able to come, park, hook up, and still have time to enjoy most of the afternoon! You can bring your pets and have a guest come and visit you at the park! They are a family friendly park with children activities and enforce quiet hours from 10:00 PM to 8:00 AM. What Do Other RVers Have to Say About Elk Creek Campground and RV Park? Estes Park KOA campground is located in the beautiful high mountain valley and town of Estes Park, Colorado. This is the gateway to the spectacular and majestic 400+ square mile Rocky Mountain National Park. You are surrounded by high, snow-capped mountains rising to 13,000 to 14,000 feet. At 7,500 feet, what’s not to love. 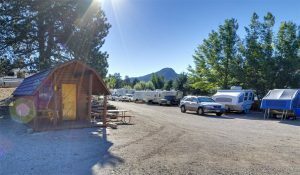 This campground is an ideal base camp for exploring the town of Estes Park and the Rocky Mountain National Park. During peak summer months, take a free shuttle to the town (1.5 miles away) to check out eccentric shops, festivals, and art fairs. Spend a day at the national park with its amazing wilderness, endless hiking trails and plenty of elk, moose, and deer. Drive Trail Ridge Road for panoramic views from 12,000 feet. Across the street from this KOA, you’ll find Lake Estes and the Big Thompson River along with world-class fly-fishing. Rent fishing gear, bikes and/or boats at the marina. Go horseback riding next door. Just down the road is a family fun park with mini golf, bumper cars, bumper boats, and rock climbing. Enjoy on-site pancake breakfasts, ice cream socials, and free marshmallow roasts. There’s free Wi-Fi, and the store is stocked with supplies and souvenirs. Arrowhead Point Campground & Cabins features generous sites. From smallest to largest, the campground welcomes every RV size on the market today. They have newly upgraded RV sites with electric and sewer hook-ups and plenty of water. They have long pull-thru sites to accommodate up to 60 foot long big rigs and plenty of room for slides. Perfect for the toy haulers! For the mid-size and smaller RV, they have sites with electric hook-ups and water. All sites feature fire pits and picnic tables to enhance your camping experience. Arrowhead Point Campground & Cabins is great for your stay in the Buena Vista area and is just minutes from numerous area attractions. Let them be your base camp for day trips to Denver, Colorado Springs, Royal Gorge, Pikes Peaks, Great Sand Dunes, Aspen, and Vail just to mention a few. The Arkansas River offers guided river rafting trips for the entire family and there are stables in the area that will take you to the local mountains for horseback trail rides or pack a picnic and rent a jeep or ATV and take them up in the high country for a scenic day trip. The activities are endless! After your busy day of play, return to Arrowhead Point and enjoy a Rocky Mountain sunset, spend an evening under the stars, and let the hustle and bustle of the city life become a distant memory. Whether you stay for a weekend, week, or even longer, Arrowhead Point is an ideal location for your camping getaway. Being centrally located, it is no wonder Buena Vista, Colorado is a destination-vacation! What Do Other RVers Have to Say About Arrowhead Point Campground? “I was there in late September, and this was a return trip for me, as I was there last year. I did not have a reservation, but you probably should have one in most cases. Check-in was friendly, quick and organized. The grounds are perfectly clean. The sites are medium sized but not cramped at all. I built a nice fire in the fire ring in the evening and sat outside. As the ring is right out front I was able to chat with people as they strolled by. I saw lots of children playing, dogs being walked. It was quiet and peaceful. The view out over the Arkansas River Valley as great. I have seen some people complain about phone coverage. It is poor, but the entire area is weak, as you are right in the center of the Rocky Mountains. Be reasonable. “We live in Centennial, Colorado, and love Buena Vista. We make a trip here every year to enjoy the Collegiate Peaks and fishing opportunities. Buena Vista is a quaint mountain town without a ton of amenities. This park has several types of sites. Tent, RV (full hook-ups, water/electric, electric only), cabins, and yurts. We usually stay in the full hook-up area. We have a pop-up camper. When you arrive, a gentleman (who has worked here as long as we have been visiting) takes you to your spot in his golf cart. He guides you into your spot. If you believe you are unable to do it yourself, he will jump in your vehicle and do it for you (we saw him do it for the man in the spot next to us). He’ll also carry your firewood up for you. The sites are your usual . . . a fire pit, and a picnic table. Each spot is mostly level and is gravel. Most spots have little shade. If you stay in the spots in the middle of the park, there is grass and a few trees. These spots are electric/water only. They have a playground and horseshoes. They have a small shop with knick-knacks and camping supplies, ice, and firewood. Firewood is $6 each, or $15 for three. 10 lbs of ice are (I think) about $3. The one complaint I have is the lack of enough showers. They have about 65 sites total, and there are three unisex showers, and a bathhouse with two showers each for men and women. Because of the use that the showers get, sometimes you wait for a shower. And when you DO get to the shower, it has been used a lot, and there is water everywhere, hair on the floor . . . you get the picture. Showers are inexpensive, however. 50 cents for 3 minutes, and up from there. Prospectors RV Resort is a full-service campground in the heart of the Royal Gorge Area. They offer 126 Tent/RV spots, 13 cabins, and are open year round. The Royal Gorge area had a huge setback with the fire of 2013, and all of the businesses worked diligently to restore the tourism here. Mike and Rhonda’s (the owners) vision is to create the most enjoyable, family-friendly resort on “8-Mile Hill”. The Gorge entrance is exactly 8 Miles from Canon City proper – hence the name “8-Mile Hill”. With the help of their families, the Schirados everyday commitment to making lifetime memories for their guests is a dream come true. They hope you will join them to create vacation memories for you and your own family! Due to the devastating fire that we (Colorado Springs Area) endured in 2013, this campsite is back up and running. 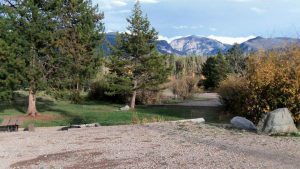 The owners purchased the campsite after the fire in 2014 and have been working diligently to get it back up to par and fill all the spots with loving families looking for a great time away from the city life and enjoy beautiful views of the Royal Gorge. Besides all of the important camping amenities, the owners have gone out of their way to bring in the jumping pillow, pedal carts, and so much more. Over the summer months, they even have a Kid’s Club Day Care (you need to pre-register for this). What Do Other RVers Have to Say About Prospectors RV Resort? Manager- the less-than-professional front desk manager in 2016 has been replaced with Melissa, who is very professional, competent, and has a great attitude for the job. Pool- the freezing 2016 pool was now a very comfortable 85 degrees. Our small kids had no problem with the temp. The hot tub was missing but the new one was on the way I was told. We somehow forgot to show the kids the new water slide; we will next time. Permanent Residents – the junk-filled permanent resident sites noticed in 2016 were completely cleaned out this time. I was told by the owner, Mike, that they eventually decided to kick these residents out. Alcohol Use – the over-consumption noticed in 2016 in the public area by the front office was not present this time. It could just be us, but both my wife and I also think the liquor section of the camp store is smaller than in 2016. Playground – the disheveled young kids playing unattended at the playground for hours on end in 2016 were not there this time. We suspect that went away with the permanent residents that were asked to leave, but this is just speculation. The owner, Mike, said the changed nature of the place is ultimately because of Melissa and her husband, who took over management sometime between 2016 and now. Great job Melissa and husband, and kudos to Mike and his wife Rhonda for making the smart decision to put you in charge! We will now plan on making this an annual outing. BTW – No issues with utilities; electric, water, and sewer worked great for the duration of Memorial Day weekend, and it was a mostly full campground. Wifey did have trouble with the WIFI log-on, but we just roamed for what we needed, not a big deal for us. Enjoy spectacular views of “America’s Mountain,” Pikes Peak. 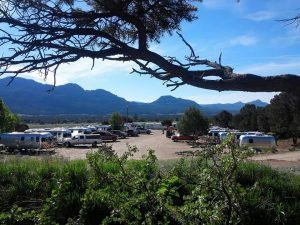 Garden of the Gods RV Resort is located among two of Colorado’s historical mountain towns, Old Colorado City and Manitou Springs. 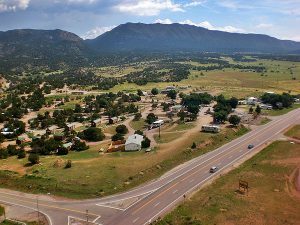 These amazing little towns will make your camping experience in Colorado Springs truly memorable. Adding to this, they’ve upgraded a bit to give you the modern comforts. Ideal for outdoor enthusiasts, families, rallies, and even individuals who want to “disconnect” and explore the picturesque surroundings of the Garden of the Gods. The location of this resort is at most 20 minutes from any extra activities that you would like to do, like hike Garden of the Gods, take a drive up Pikes Peak, or even drive north to the Air Force Academy. I would suggest staying at least a week so that you can try and see everything Colorado Springs has to offer. Welcome to one of the summit’s best-kept secret! Tiger Run Resort is situated between the pristine Swan and Blue Rivers, sheltered by the majestic Ten Mile Mountain Range. They are a full-service RV site or mountain chalets (cabins) and are the gateway to the finest in Rocky Mountain recreation. Nestled in the gorgeous mountain town of Breckinridge, you are just going to love the Tiger Run Resort. This full-service RV luxury at its absolute finest awaits you at Tiger Run Resort, where our extraordinary location and excellent accommodations are certain to satisfy even the most particular traveler. Cradled between the pristine Swan and Blue Rivers, sheltered by the majestic Ten Mile Mountain Range, we are your premier gateway to the finest in Rocky Mountain recreation. Extraordinary sightseeing, unique shopping, four seasons of outdoor sports, and activities of all types are at our doorstep. Historic towns and communities await the modern explorer. Hike or bike over 60 miles of scenic trails and paved bike paths, from Breckenridge to Vail. Test your fishing skills in the crystal clear Gold Medal waters of our two adjacent rivers. Challenge the slopes at world-famous nearby winter sport and ski areas. Whatever your interests, you’ll enjoy the wilds of Colorado nature in all its forms, where imagination is all that limits you. What Do Other RVers Have to Say About Tiger Run Resort? 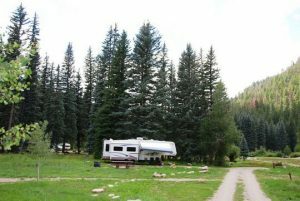 Do you know of another Colorado RV campground that we should add to the article? Please add your suggestion in the comments below and I may just have to check it out and revise the article. Thanks for reading this article and if you would like to email us directly, please feel free to visit our Contact Page to send an email.